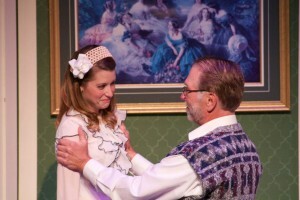 “The Last night of Ballyhoo” is charming look at a Jewish family at Christmastime in Atlanta. It is December of 1939. Hitler recently conquered Poland, Atlanta, Georgia, is abuzz as the World Premier of “Gone With the Wind” is about to take place there. And equally exciting to persons in Atlanta’s Jewish community is the upcoming cotillion ball, the concluding event of their celebration “Ballyhoo.” The play’s action takes place in the home of Adolph Freitag who is the family patriarch. He is a bachelor, living with widowed sisters, Reba and Boo. Reba’s husband was Adolph’s brother. Yes, it is a tad complicated. The Jewish Freitags are so highly assimilated that they have a Christmas tree in the living room; and Boo is only slightly concerned when her daughter, Lala, places a Christian symbol star at the top of the tree. Boo has other concerns. Lala has returned early from her first try at college. She is a a flighty girl who has dreams of making something of herself, but has no follow-through. She is also attracted to anything wearing pants, and becomes particularly obnoxious when Joe Farkas, an employee of her Uncle Adolph appears at the home. Boo is a very pretentious woman who doesn’t seem to care about anything except what people might think about her! Sunny Freitag is Lala’s cousin She is Reba’s daughter, and is excelling in her first semester of college in the Northeast. She returns to Atlanta for the Christmas break. She has the class and wisdom that Lala lacks! She could care less about the upcoming “Ballyhoo” ball, whereas Lala is desperate to attend but having difficulty finding a date. Adolph’s employee, Joe, is somewhat horrified with the advances of Lala. He is Jewish, from New York, and takes faith and background more seriously than do the Freitags. He is, however, impressed with the academic and beautiful Sunny! The cast is very good. Adolph is obviously in charge of the group, but doesn’t rule with an iron fist, letting the widowed sisters bicker among themselves while Lala is off to hopefully meet Clark Gable at the “Gone With the Wind” premier in town. 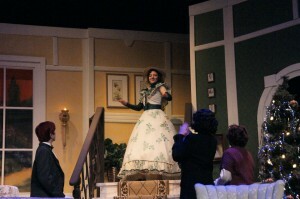 Maggie Hayes is a hoot as the over-the-moon Boo Levy. Linda Johnston is subdued excellence as Reba. She is proud of her accomplishing daughter, Sunny, but doesn’t rub Boo’s nose in the daughter’s success. Lydia Carswell is delightful as the somewhat-crazed Lala, and Sunny Freitag is as “sunny” and charming as her role implies. 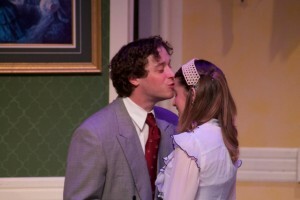 Luke Corliss is convincing as Joe, the New Yorker who is somewhat appalled at the lack of Jewish understanding displayed by the Freitag family.. Near the show’s conclusion Evan Bo appears as Peachy Weil, the young man that has been coerced into taking Lala to the cotillion. He is a wonder – with flashy red hair, wild tales, and a “wow” to the entire family (and audience). Offstage there are substantial family connections. Noel Johnston and Linda Johnston who play Adolph and Reba are married in real life, as are Luke and Brittany Corliss, who play Joe and Sunny. The play was written by Alfred Uhry, who also penned “Driving Miss Daisy. “ “Ballyhoo” received the Tony Award for Best Play 1997. The Greeley production is directed by Thomas P. McNally and presented by The Stampede Troupe. This is a very effective play, with a handsome set, excellent costumes, lighting, and sound. 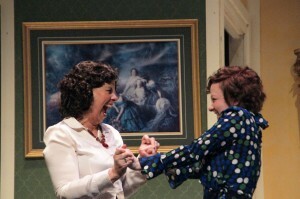 The play has aged well, and is successful nationwide, presented by local theater groups. This is a thoughtful production requiring the audience to test its own belief system while being tolerant of others. Presented by The Stampede Troupe on the stage of the Hensel Phelps Theatre of The Union Colony Center in Greeley.